Livestream Premium and Enterprise customers have the ability to push any of their streams on Livestream to Facebook Live or YouTube Live, allowing for higher potential viewership with lower effort. Important: Customers wishing to do this should ensure they are using an encoder that supports this feature. 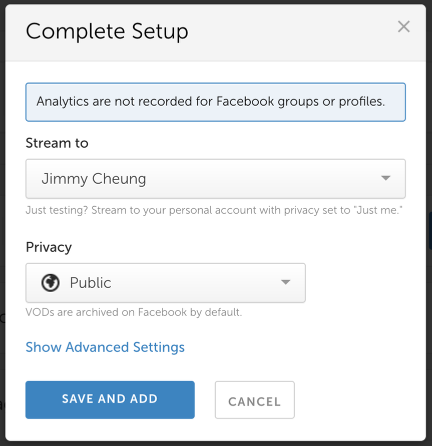 To enable this feature, log in to your Livestream account and navigate to your settings. Choose the Simulcast tab. Click below for step-by-step instructions for each provider. If you wish to simulcast from a Vimeo Premium account, please see Vimeo's Help Center for instructions. 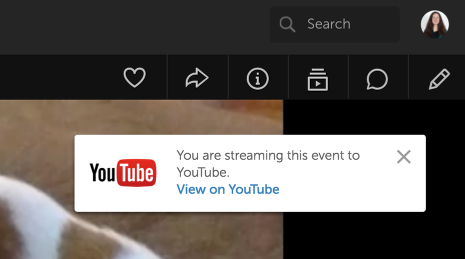 Click the blue Add button that corresponds with Facebook to connect your Facebook account to your Livestream organization. Important: Due to restrictions stated in Facebook's Terms of Service, it is not possible to use Facebook Live and YouTube or a Custom Destination at the same time. You must choose one or the other. 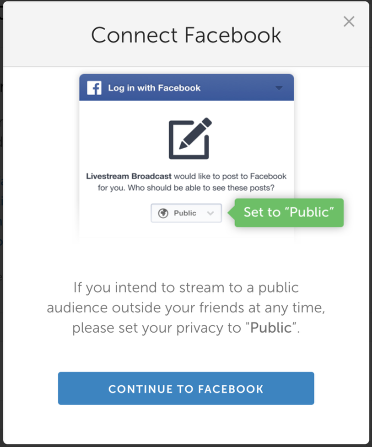 You will first see a message from Livestream notifying that if you intend to stream to any audience beyond your friends at any point, you must select Public during the initial connection steps. You can adjust this at a later time if necessary. Next, a new window will open from Facebook. You will be prompted to log in to your Facebook account if you are not already. If you are logged in already, click Continue, then proceed with allowing the requested permissions. A new window will open prompting you to complete your setup. 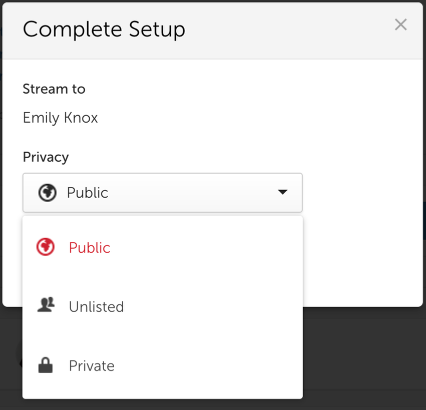 Choose where you will stream to, such as your personal profile or a Page or Group of which you are an Admin, and choose your event privacy. Show Advanced Settings reveals additional Facebook options. 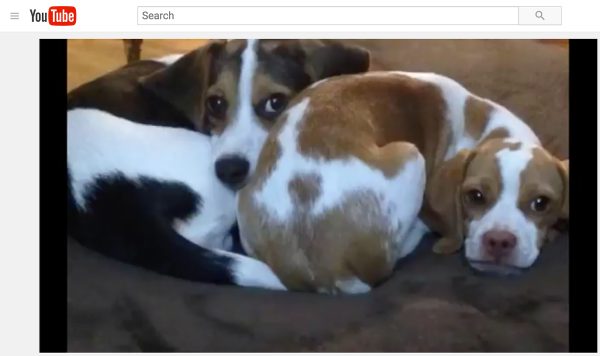 Allow Facebook embedding: Allows the player on Facebook to be embedded elsewhere; this is only an option on Public broadcasts. Continuous Streaming: Removes Facebook's eight-hour time limit for streaming. 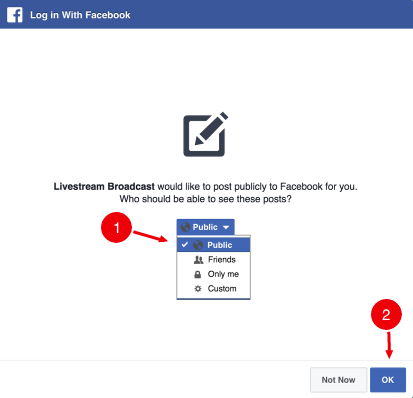 Choosing this will not save your VOD on Facebook or trigger notifications. Once you save your settings, any new event you create from here on out will automatically simulcast to Facebook. 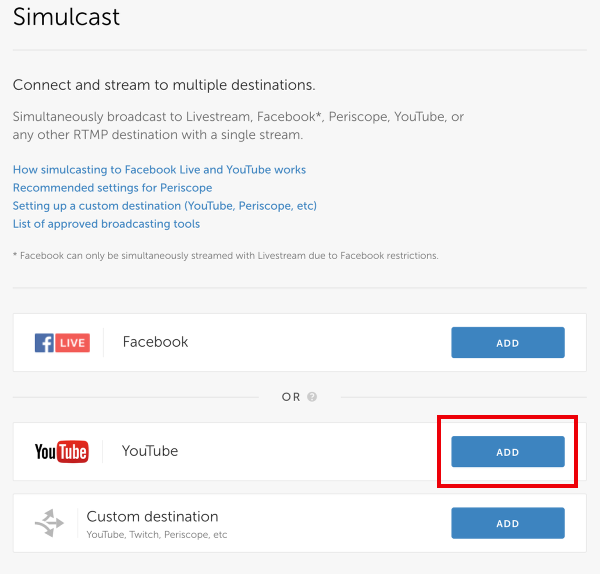 To enable simulcasting to an event you previously created, go to that event's settings. Make sure your event is published and not in draft mode. Otherwise it will not simulcast to Facebook. 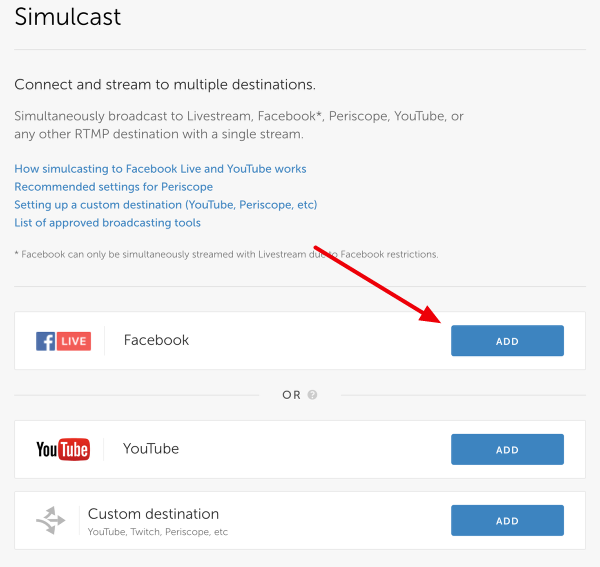 If you wish to simulcast to a Facebook Group, you must enable the Livestream Broadcast app in your Group first. 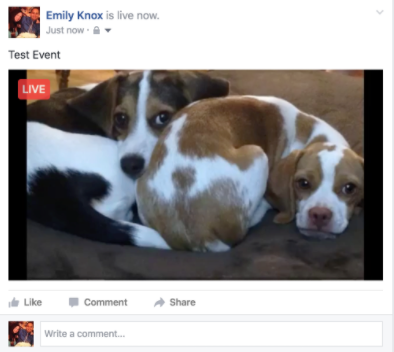 Now if you go live to your event, the stream will also appear on Facebook. You can simulcast to up to five (5) different destinations on Facebook (Profiles, Pages, and Groups). Click the blue Add button next that corresponds with the YouTube logo to log in to your YouTube account. 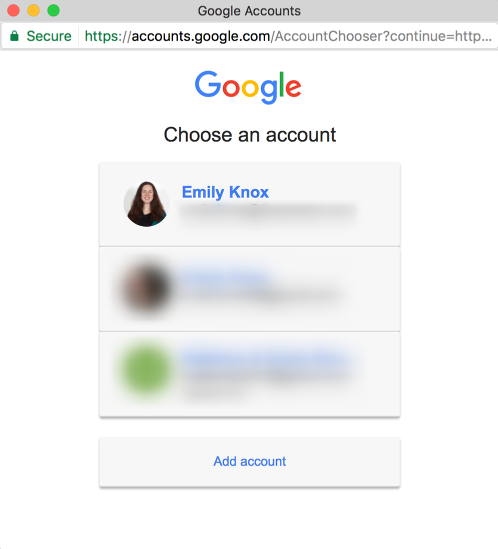 A window will pop up prompting you to log in to your Google account. Either select your account or enter your credentials to log in. 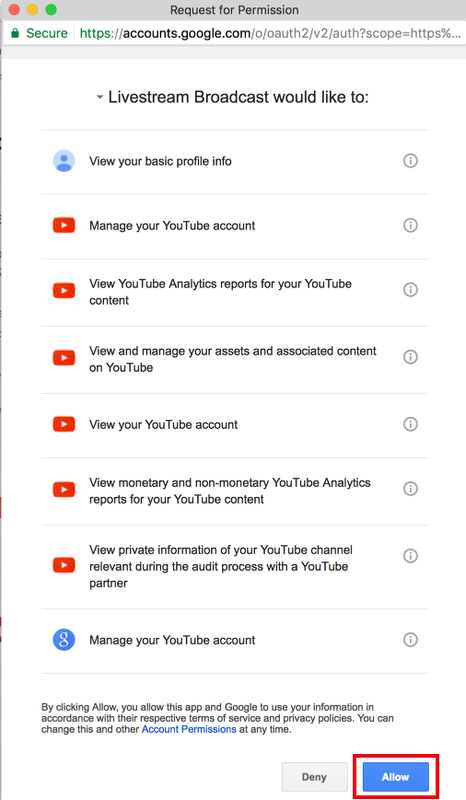 After logging in, you will be prompted to grant Livestream permission to get certain information from your YouTube account. Scroll down and click Allow to proceed. 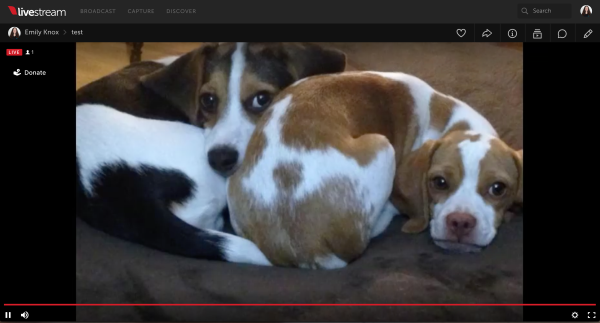 A new window will pop up that will allow you to change your YouTube privacy settings. The options are Public, Unlisted, and Private. Choose your desired setting, then click Save and Finish. Your simulcast settings will be updated. Any new event you create from here on out will also simulcast to YouTube by default. 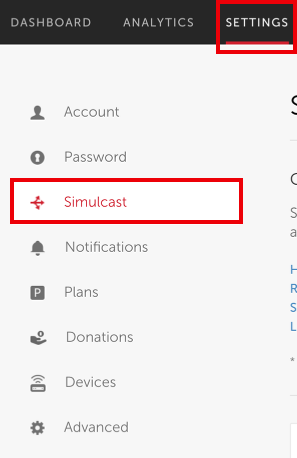 If you want to simulcast to a previously created event, go to that event's Editor > Simulcast to enable it. Please note that Livestream only supports simulcast streaming up to 1080p at this time. Now go live to your event. The stream that appears on Livestream will also appear in YouTube. Make sure your event is published and not in draft mode. Otherwise it will not simulcast to YouTube.